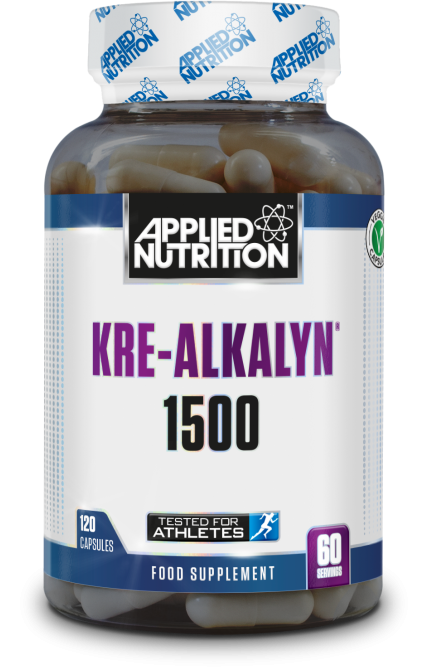 Applied Nutrition’s Kre-Alkalyn® 1500 contains a patented creatine in a pharmaceutical delivery system providing maximum stability and absorption. Conventional creatine monohydrate has very short term stability and begins to break down into the bi-product creatinine when exposed to liquid and as a result cannot be left in liquid for long periods of time. Kre-Alkalyn® 1500 is pH buffered for maximum absorption and stability. Kre-Alkalyn® will not break down into creatinine and will deliver the optimal amount of creatine into the bloodstream and subsequently, your muscles. Kre-Alkalyn® 1500 may effectively deliver more creatine than conventional creatine powder, allowing you to consume less product while experiencing more efficient and explosive effects.